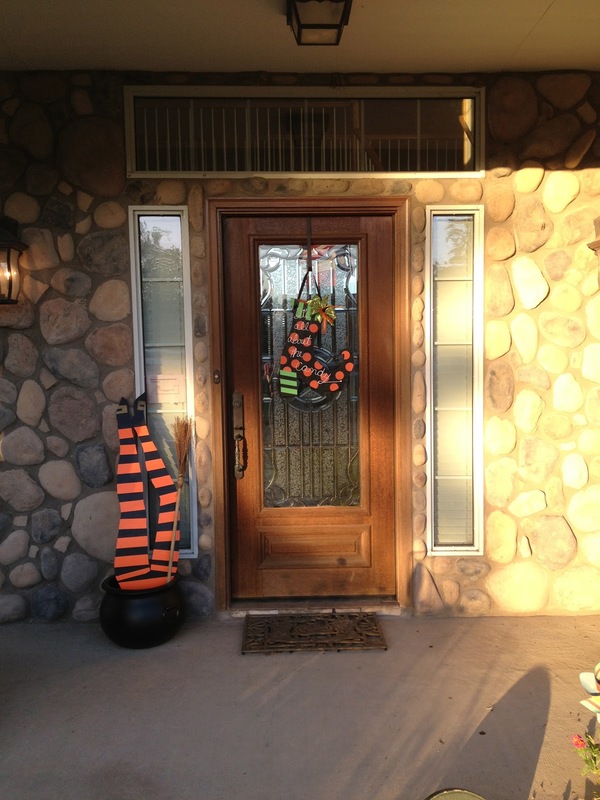 I love this time of year, except that there's always way more to do than there is time! I have so many projects I want to do right now that I can't choose what to start first, so I decided to finish some adorable blocks for Aiden/Katie I started in early summer for Christmas. I say Aiden/Katie, as I'm not sure whether they're going to be for play or display! Might be more of a gift to the mother than the little boy, but we'll see. 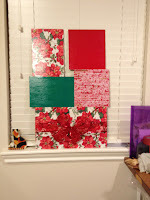 Stampin Up offered these boxes a year or so ago and I got some knowing I would have a use some time! And sometime arrived this summer. It wasn't the easiest thing to do - I had 5 blocks A I D E N and then I had to come up with other 5 letter words and/or 4 with a picture i.e. duck and I drew a duck for block 5. It was a puzzle, but it was fun. 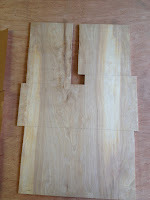 Just a few more coats of finish and they'll be ready for the Christmas box. I hope they enjoy. Note: Archiver's bags are great for protecting your work surface and a great way to reuse a plastic bag! 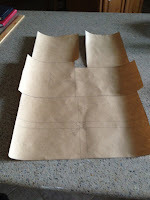 Now back to the sewing machine to start a stitch bible! 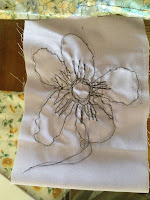 Perhaps, the next real project will come to mind as I watch the different stitches my machine will make! My friend Liz Kettle showed me how to do this and a new class I just signed up for "Stupendous Stitching" on Craftsy gives it as the first lesson, so I'm going to get started tonight and see just what my new machine can do. 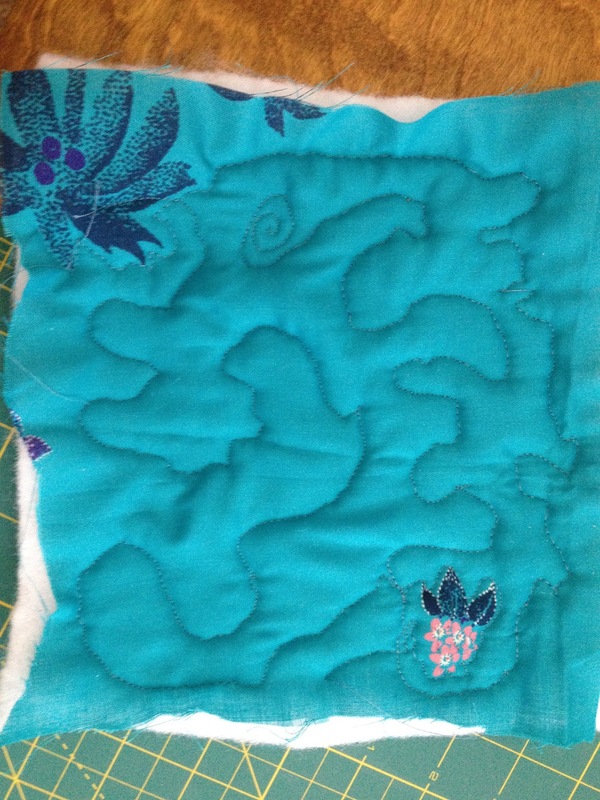 Next post : Stitch Bible - See you soon! 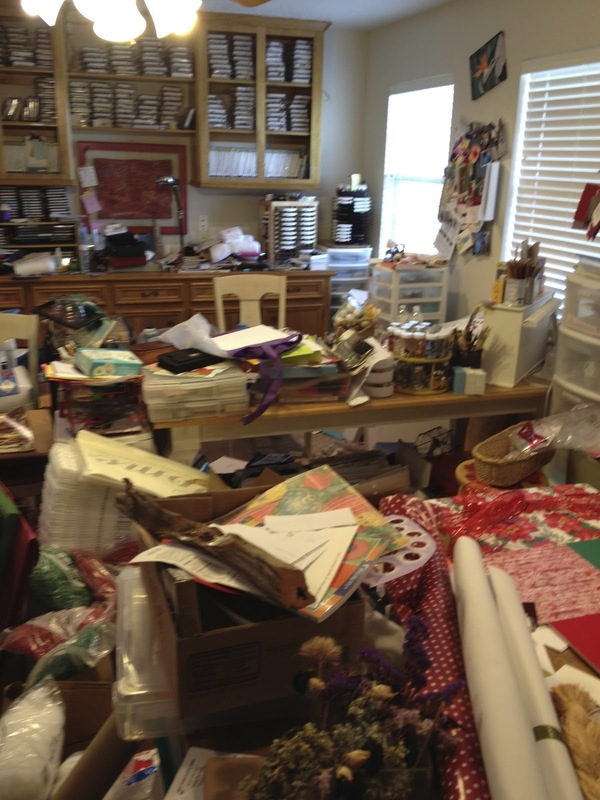 I mentioned this the other day, either in a post, to a friend or on Facebook, but I think the most important part of changing the name of my work area from craft room to studio is the mental picture that is formed in my mind. As a craft room I just don't take things as seriously and I don't look at what I do as art. I thought it was the word craft, but I looked up the word craft and found the following: 1: skill in planning, making, or executing:dexterity and 2 a: an occupation or trade requiring manual dexterity or artistic skill and 2 b plural: articles made by craftspeople . I looked up the word crafter and found the following synonyms: artificer, artisan, craftsman, craftsperson, handicraftsman, handicrafter, handwork and tradesman. So, now we know that the word craft is not the issue as craft = art! So the problem with craft room and it's effect on me is the word room. Room just doesn't sound as artsy as studio. This is just me and really it has no bearing on what I will or will not create (at least I hope not), but I do like the ring of it and so it shall be "the studio". Perhaps this comes from the magazine Studios that comes out four times a year from Cloth Paper Scissors, but whatever, it's now Bev Ann's Studio and it's all cleaned up! 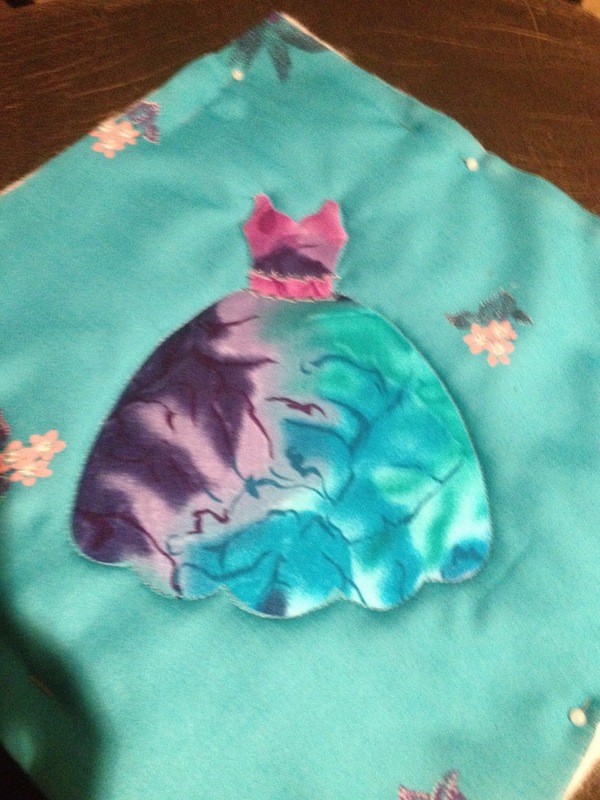 I finally was able to move my new Bernina into it's place and am having fun playing with it. 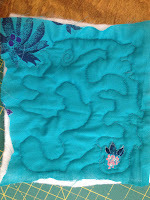 My goal is to do freehand quilting using my photos and original art to make wall hangings, table runners etc. Small items, no king size quilts for me. However, I'm not saying never, because I know what that can cause, so I'm just saying what my goal is! Ha Ha - learned that from the "never want to sew comment" and so hopefully, I've expressed this in a way I won't have to eat those words, too! 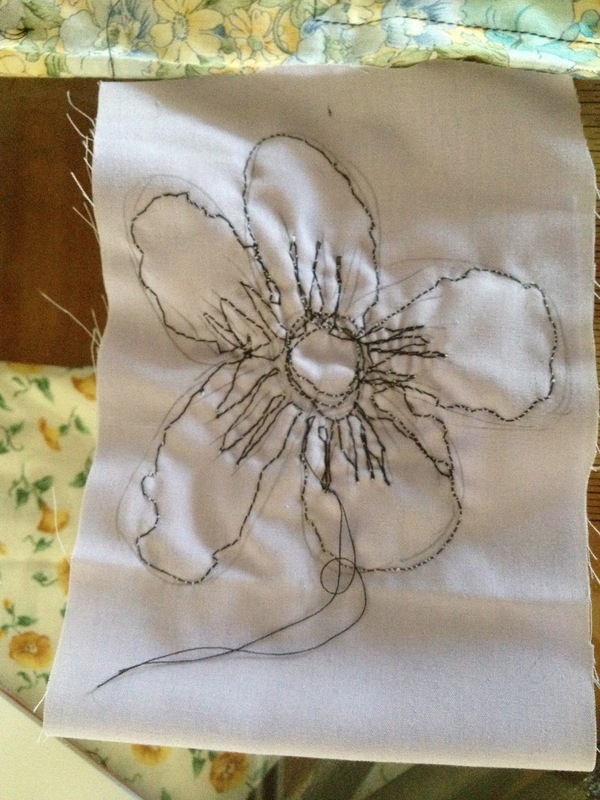 My first effort was to make square of fabric, batting and backing and just freehand stitch! 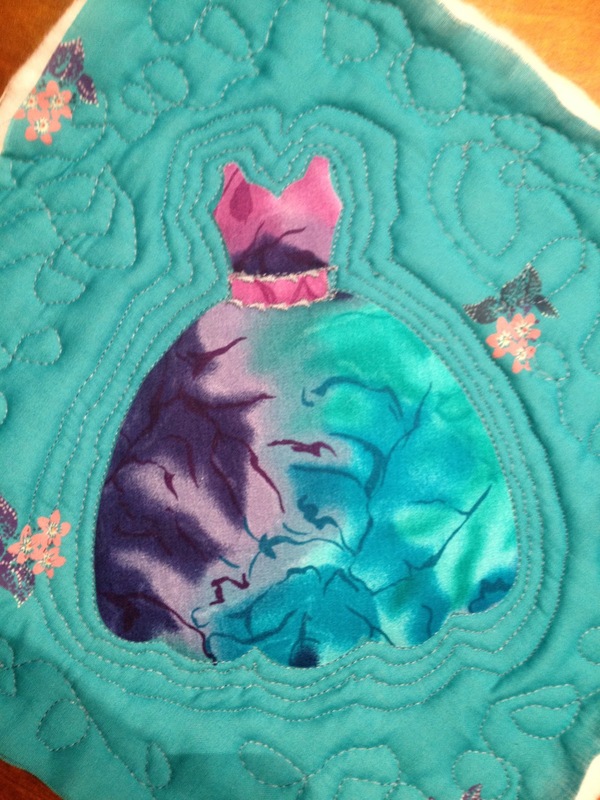 Next was a plain piece of fabric that I drew a pencil shape of a flower on and then I began by practicing on a fun diecut dress from Sizzix. This die is new and I just think it's adorable, so I cut out one, adhered it to the base fabric with Misty Fuse. How did we ever get along without this! 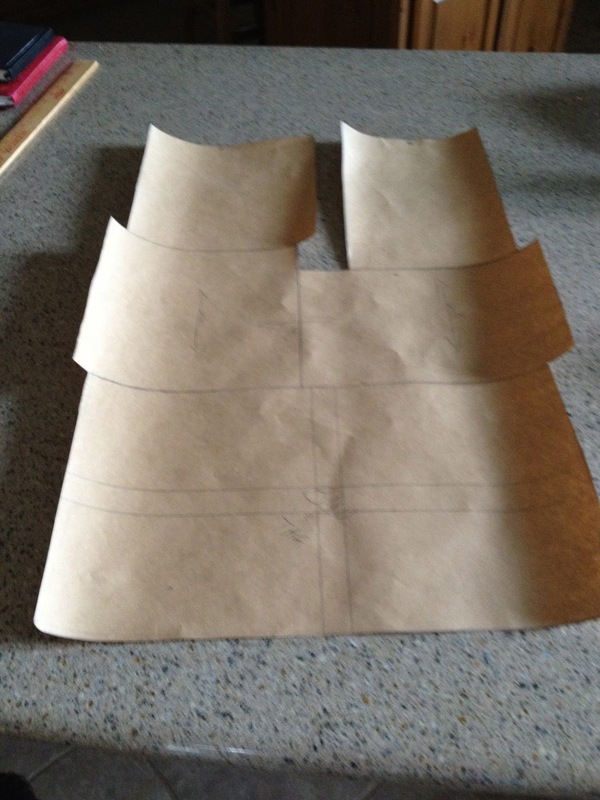 Anyway I digress, I made a sandwich and began to stitch around the design and then tried to echo the dress outline, moving on to freehand quilting the remainder of the block. As you can see, I have long way to go before my echoes are clear and evenly spaced, but a girl's got to start somewhere. 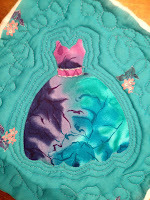 I had a class all day at It's A Stitch, my local Bernina dealer, and I learned a lot and had lots of fun and laughter. This machine is so different from any I've ever used and I have to learn to relax and let it do the work! And, so when I got home it was more practice. 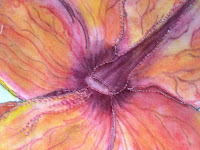 This time I started with a flower I had painted on fabric, just trying to outline the flower and do some thread painting, but I wasn't pleased with the thread I had chosen and so I moved on to another practice piece. One of the women at the shop suggested that I pull out a fabric with a distinct pattern and practice outlining the design and so I did. I inherited my friend Emily's fabric so I have so much to choose from and I think I found a perfect piece. I have yards of it, so I will be able to practice for a long time! Emily and I were soul mates when it came to buying! If one yard was good, then 20 would be so much better! Ha Ha No that's really not funny, that's sadly the truth! But looks like I will have a chance to put her fabric to good use and I won't need to step into a fabric store for a long time. Oh, my gosh, I forgot all about my "studio" here's a picture of before (with all the stuff out of my closest - forgot to take picture before I began the process) and after! For those of you who had recently been in my "room" you can see a huge improvement! For those of you who have never seen it, I'm sure you are saying, Oh my gosh, she has sooooo much stuff! You see the condition of the room is all in perspective and mine is that it's all cleaned up and a "studio". Gotta go, my machine is calling to me! Words Should Always Be Covered In Chocolate! A very dear friend once told me she always covered her words in chocolate, so if she had to eat them she would enjoy them! This is very good advice and I'm so glad I listened to her. Thanks, Deb! Now don't think I've turned my back on those saws, I have not! 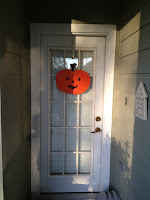 I just cut out a new piece for my front door last Sunday. I have worked on it this week preparing it with colored papers. I've added a ribbon and bow to the bottom package and will add more ribbon and bows to the rest of the gifts, and it will be ready for decoration day. And, that brings up a whole other topic - Thanksgiving Day. My sweet husband and I have gone to "Autorama" every Thanksgiving evening for over 20 years and they changed the dates. There is no Thursday evening show this year - I can't tell you the disappointment that flowed through our house when we discovered this tidbit of information. But recovery has been quick and we shall use Thursday afternoon to put up our outside decorations, or at least get started. Friday we will do Autorama and Saturday, I will be in a sewing machine class all day!!!!! Sounds like a great holiday weekend to me, with much to be thankful for this year, as always. But now back to the reality of today! What to do with the new machine? Every inch of my craft room is covered! Way too many projects going on at once and to be honest, just way too much stuff. And so my new machine sits on my dining room table as I gut my room and rearrange, redecorate, get rid of much and make a place for this new treasure. So as much fun as this is, I must stop, get off of my fanny and head back upstairs and face the mess! The soon to be organized, great to look at and even greater to create in studio! I mean it's going to be soooo neat and it will deserve the name studio! Pictures to follow soon. Where does time go? It seems like only yesterday I was cutting out witches legs and shoes with a pumpkin or two for good measure and now it's November and less than two weeks from Thanksgiving. 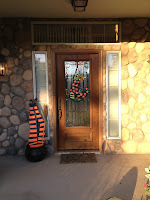 I had so much fun with the shoes and the legs and a blast with all of the little goblins that came to our door. 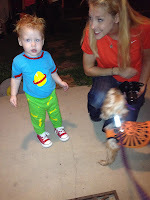 Our little dog Jack wore a Halloween T-Shirt and loved greeting at the door. Now if I could just train him to give out the treats! Ha Ha - he'd eat them all! We had around 60 little ones this year but none as cute as little Bentley. 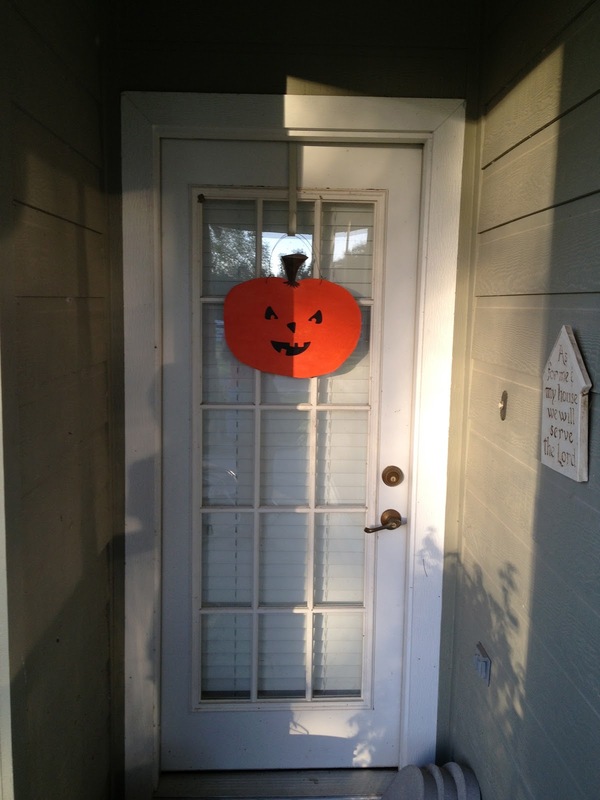 I painted a large pumpkin for our front door (left) and two smaller ones for the two other front doors! 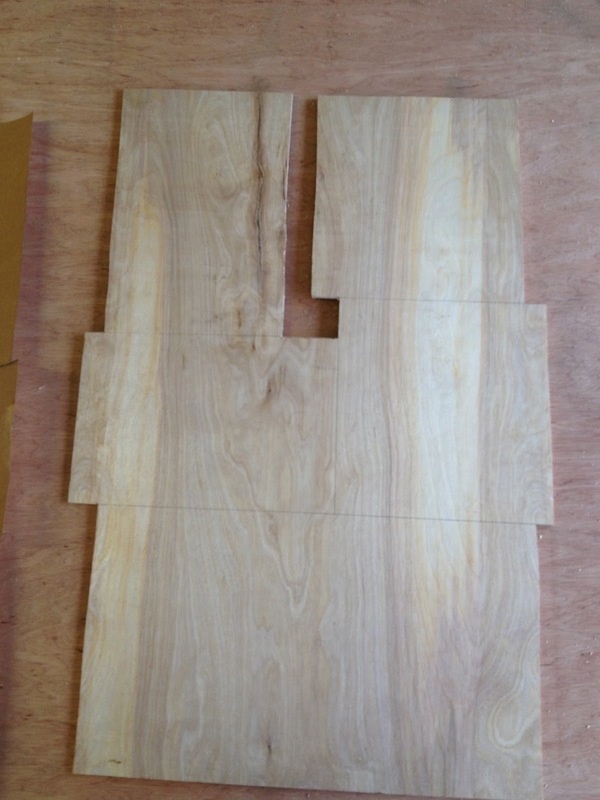 Don't ask - I think I may have mentioned before that we have a main front door and two smaller ones. I painted the backs of the small ones to be Jack-o-lanters and the fronts to be plain pumpkins. 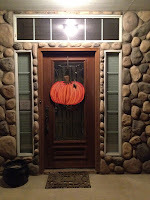 When I turned off the lights after the last little trick or treater, I flipped them over, brought in the legs and the shoe, hung the large pumpkin on the door - instant change to Thanksgiving/fall theme! 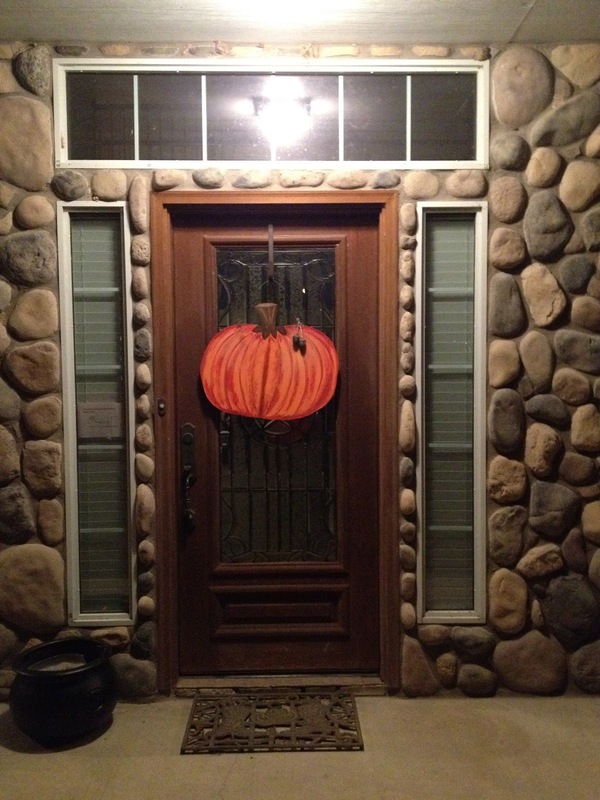 Quite proud of myself for the double duty on the small pumpkins. And now it's on toward Christmas! I've drawn some cute plans for a door decoration and I want to cut out and make some other items for the yard - just two weeks and we'll be changing over to Christmas! Again, I say, where does the time go?